We were going to visit family after our trip so instead of flying back to Chicago, we took the direct flight from London to Phoenix. It meant we had some extra time to fully experience first class. We were seated in seats 4E and 4F in the middle of the cabin. These were probably the least private seats in first class. In addition, the wardrobe was located in front of the seat so not accessible at all while seated. Storage was all around lacking in the middle seats. I would definitely recommend booking two windows as a couple since there is a buddy seat with a seatbelt you can use should you want to dine or sit together. Row 1 would be best, but those are generally reserved for BA frequent fliers. If you really want to be next to each other, row 5 would probably be better. Unlike business class, the seat went fully flat and I could fit without bending my knees when fully flat. The seat was controlled with a dial so you could not adjust the footrest or recline separately. There were also lumbar and neck support controls. I found the seat relatively comfortable but did have to get up to stretch out some neck/shoulder pain a couple times. Just after boarding, the flight attendants passed out the very nice toiletry packs and pajamas. There were different bags for men vs women and had everything you could need to freshen up after a flight. The bag itself was also very nice and definitely worth reusing. We both changed into the pajamas after takeoff and they were very comfortable. They also offered a pre-departure beverage of your choice. I had champagne and Samantha had a Diet Coke. The flight attendants also passed out the menus at this time. You had the option of having lunch immediately or later in the flight. We decided to eat immediately. I had the scallops, french onion soup, hake, and hazelnut brownie for dessert trying a white, red, and dessert wine. Samantha had the scallops, salad, beef dish, and rhubarb and almond dome for dessert. Lunch was done about 2.5 hours into the flight. The flight attendants passed through the cabin about every 15 minutes to see if anyone needed anything. About an hour and quarter before landing, we were asked whether we wanted anything to eat before landing. I had the prawn salad and Samantha had the bacon roll. Both were good but nothing special. I had read reviews that British Airways first class was the world’s best business class. I can understand those sentiments now. It was very comparable to our Cathay Pacific business class flight to Hong Kong last year. 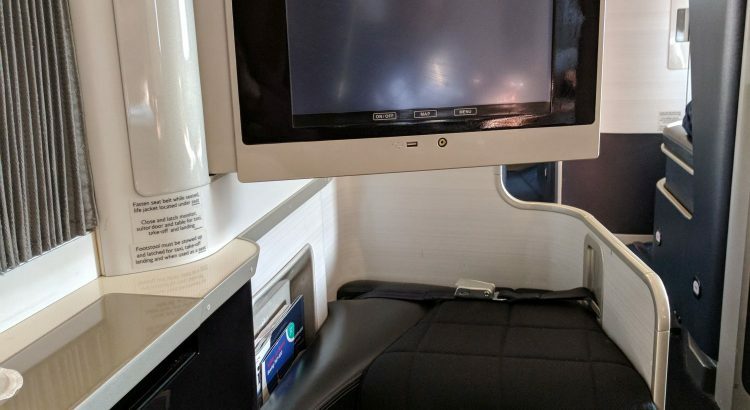 With the suites and showers on other airlines in first class, British Airways just is not competitive. This is not to say we had a bad experience. The food was good and the flight attendants on our flight were fantastic, always walking around to see if you needed anything. It was a great end to a great trip.